This past Friday, June 6th, anxious downhillers in Colorado finally got a taste of lift-serviced riding for 2008. 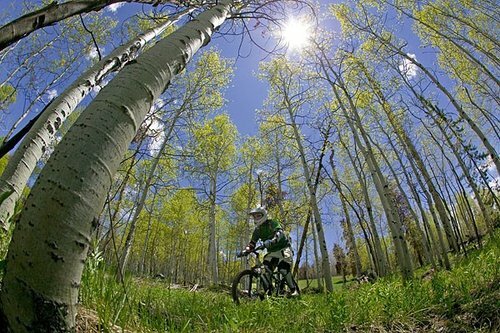 The snow is finally gone, the lifts are running and the trails are prime at the SolVista Bike Park near Granby. The signs are ready and so are the trails. 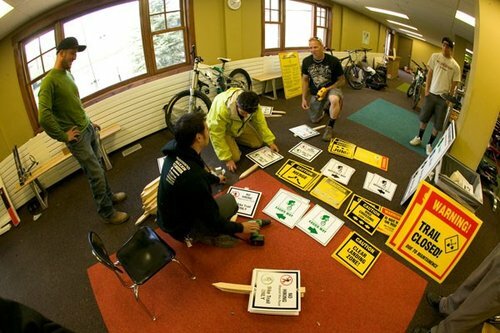 The Solvista Bike Park crew prepares for opening day. SolVista had hoped for an opening day in mid-May, but Mother Nature had different ideas. The huge snowpack from this past winter meant melting was going to take longer than normal at 7000 and 8000 foot elevation levels. Combine the deep snowpack with late season snowstorms and all any downhill biker could wish for was a set of skis or a snowboard. Last minute preparations are made as the opening hour creeps in. After two weekends of planned openings which followed by cancellation, the SolVista Bike Park crew was just as anxious as anyone to get the lift running and the trails ridden. 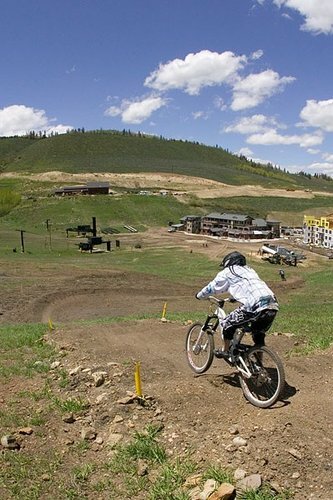 Granby Ranch, which operates SolVista has stepped it up for 2008 with an increased devotion to gravity-fed mountain biking. The winter had been spent planning and organizing and now the time had come to see it pay off. The rocks and trees were just as anxious as riders to see some action. 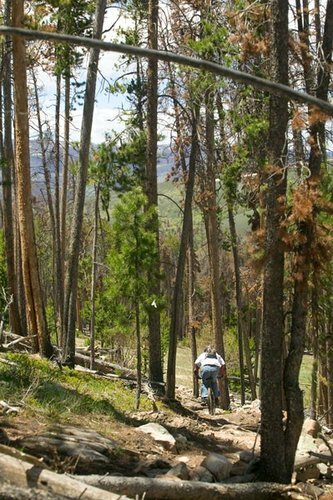 Thankfully, the week leading up to opening day was warm, leaving the mountain dry, except for a few sections of trail. The time had come. The ticket office was open, the demo and rental bikes were dialed and the lift was ready to transport downhillers to happiness. A strong showing of riders shrugged off their jobs and made a wise decision to go riding that sunny, Friday afternoon. A great day for singletrack and solitude in the mountains. Bikes were dusted off and bodies were covered in dirt. Riders chomped at the bit to be first on the lift, but before the day was over, most everyone was well-spent from their multiple laps and tangles with the infamous whoop section. By closing time, the lift was almost empty as some riders ponied up for a beer at the bar and others drove home tired, but stoked. The weekend carried on with a large showing of shredders on Saturday and Sunday, each one psyched that summer and downhilling have officially arrived in Colorado. A beautiful sunny day with white Aspen groves to cruise through. 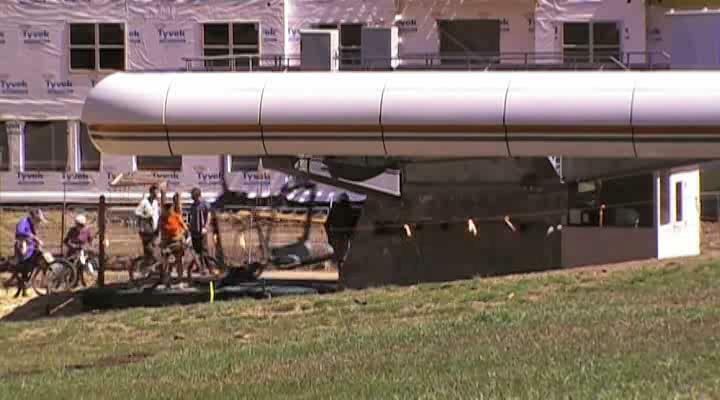 The SolVista Bike Park is in its second year of operation. Currently there are five trails open and five new trails to be finished as soon as possible. A dual slalom track and pumptrack will also be built near the brand new Base Camp Lodge. Murray Latta bike-specific lift chairs (just like Whistler) are currently being fitted and installed to increase load capacity, which means more time for knobs in the dirt. Blasting the road gap under the perfect skies. SolVista is also proud to announce their Elite Demo Program which allows riders to try out the World's best bikes before they buy them. 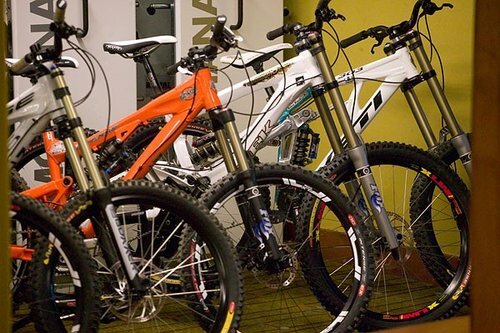 Bikes from Intense, Trek, Santa Cruz and Yeti are available for demo. This includes top-of-the-line models like the M6, V10, 303 and Session 10. 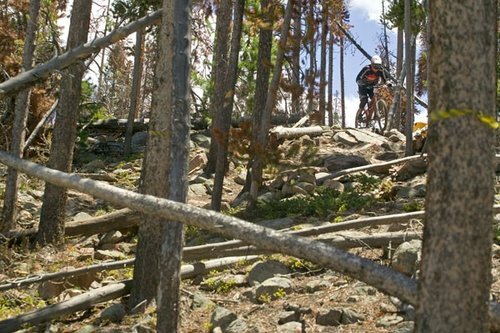 The cost of the demo may be applied to the purchase of a bike at select dealers in Denver and Boulder. Additionally, SolVista offers a complete rental fleet of bikes and protective gear, a full-service repair shop and a retail store. Wanna ride them? No problem with the Elite Demo Program. There will be two Mountain States Cup races at SolVista this year along with instructional camps and private lessons. To make sure you take advantage of the complete SolVista experience, visit www.bikesolvista.com and see what they have to offer. Thanks to all the riders who showed up. We look forward to seeing more of you this summer! The whoops can't stop Cody from Steamboat. [PI=2126334 size=m align=c]Don't worry, the trails will be there all summer long. Come and have some fun at SolVista. Check out the video from Opening Weekend! the whoop section in that vid looks sweet; that one guy flew through there. Looks pretty good, don't get me wrong, I'd love to have somewhere like that nearby to ride at but; the video hardly makes it stand out amongst the other bike parks you could go to. Solvista was freakin sick! I got to ride it 2 days ago. I also got to ride the long trail at winter park yesterday. It was super sick!!! WOW, what a beautiful resort, colorado here i come! Wow, thanks for letting us know now!!! That guy had a nice full face.